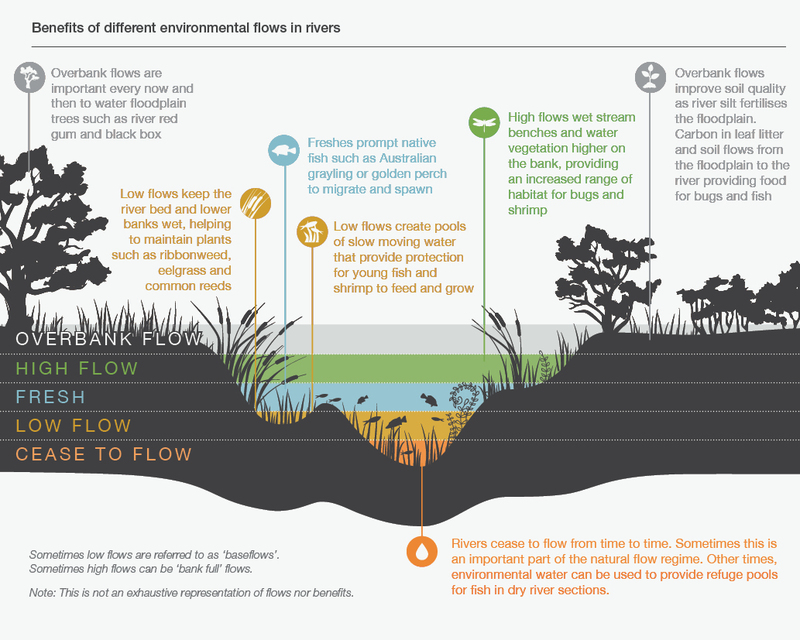 There's a lot of technical terms when it comes to describing different types of environmental flows. To break through the jargon and help you understand what they mean, we've put together a list of some of our most commonly used terms about flows. This is when there is no apparent flow in a river and partial or total drying of the river channel. This is a common natural occurrence in many Australian rivers and is only a risk to animals and plants if it lasts too long or occurs in rivers that would naturally have permanent flow. Low flows (or baseflows) provide a continuous stable, sustained low level flow in a river. The flow may be limited to a narrow area of the river channel but is important as it connects habitats within the channel and supports plants and animals that only live in water. Low flows also keep the river bed and lower banks wet helping to maintain native plants and trees that live beside waterways. Freshes are short-duration flow events that submerge the lower parts of the river channel. They are important for plants that grow low on the banks and provide opportunities for fish and other animals to move more easily along the river. High flows are larger and last longer than freshes. They usually fill at least half the river channel, and therefore are important for plants that grow higher up the bank. High flows also encourage some species of fish to move and breed. Bankfull flows are large enough to fill the river channel with little spill onto the floodplain. Bankfull flows have high energy; they move large amounts of sediment and help to shape the river channel. They can also act as a trigger for breeding in some fish species. Overbank flows exceed channel capacity and spill onto the floodplain. These flows improve floodplain productivity, fill wetlands that provide feeding and breeding opportunities for waterbirds, fish, frogs and turtles, allow animals to move between the river channel and floodplain and help disperse plant seeds and fragments, nutrients and carbon. Passing flows are water that is released from storages (such as reservoirs) to operate river and water distribution systems. Passing flows help maintain environmental values and other community benefits. Return flows are the component of water that is delivered to a river or wetland for environmental purposes that either flows back into a river channel or out the end of a river system and is able to be used for other environmental purposes further downstream. Unregulated flows are natural stream flows that can't be captured in major reservoirs or storages. 'Peak flow' is the highest point of an environmental flow. Ramp up and ramp down refers to the process of increasing or decreasing the amount of water released from a storage (such as a reservoir) over the course of a flow. Ramp rates are deliberately controlled because they can influence how animals and plants respond to an environmental flow. For example, a native fish species may require a fast ramp up but an extended ramp down.